There are multiple options for easily forwarding email correspondence to Mothernode CRM Customers and Contacts, including our Chrome Extension (Gmail) and Outlook Add-in. In this article, we focus on an additional method that you can use with any email client. Please note that this method only works if your email address tied to your email account matches the email address that you use to log in to your Mothernode CRM account. This requirement is a security protocol in Mothernode CRM, to protect your Mothernode account from receiving spam email. If the email address does not match, Mothernode will reject any email it receives, again as a security precaution. Mothernode CRM maintains one unique email address that you can copy, place into your email client’s address book, and subsequently include in your sent email (in the BCC: field). 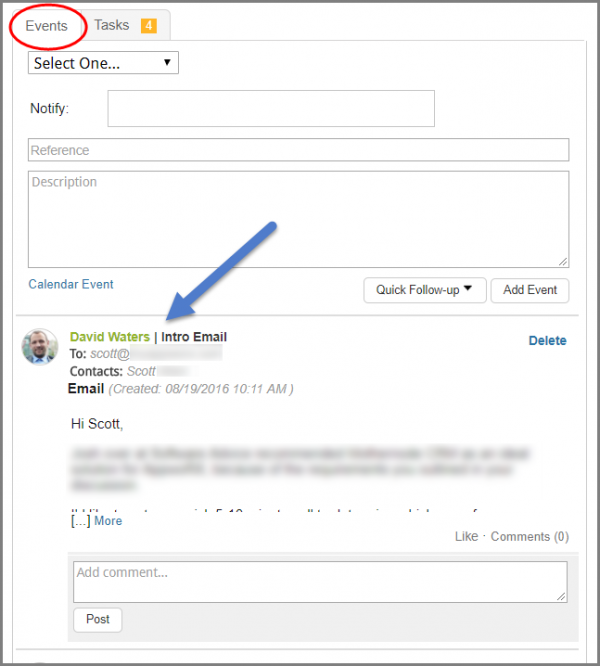 Your sent email that includes the special address will insert the email correspondence as a note within the Events tab for both the Customer and Contact that the email is sent to. The unique email address is the same across all of your Customer profiles, so you only have to save this once to your email client’s address book. Set it up in your address book under a name that is easy to remember, such as “MN Customers” or a different name of your preference. Now, when you respond to a customer email and would like to copy the correspondence to the related Customer and Contact record in Mothernode CRM as a note, simply add “MN Customers” (or preferred name in your address book) to the BCC: field in your email, and Mothernode will automatically add the correspondence. Click here for more information regarding the Mothernode CRM Outlook Add-in. Click here for more information regarding the Mothernode CRM Chrome Extension.